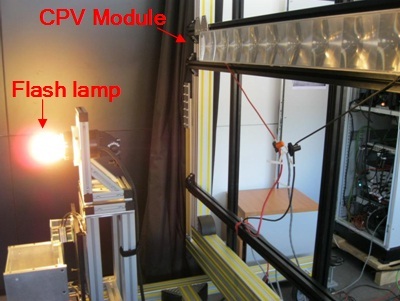 The solar simulator for CPV at ISFOC serves a complete indoor characterization of CPV modules, which has the special property of collimating the light rays in the angular range as the rays coming from the real Sun. 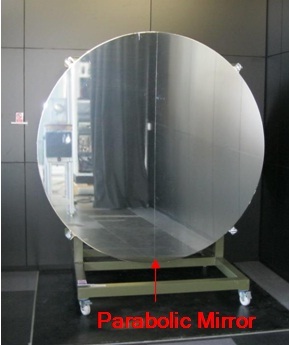 A parabolic mirror is used in order to reach that requirement. 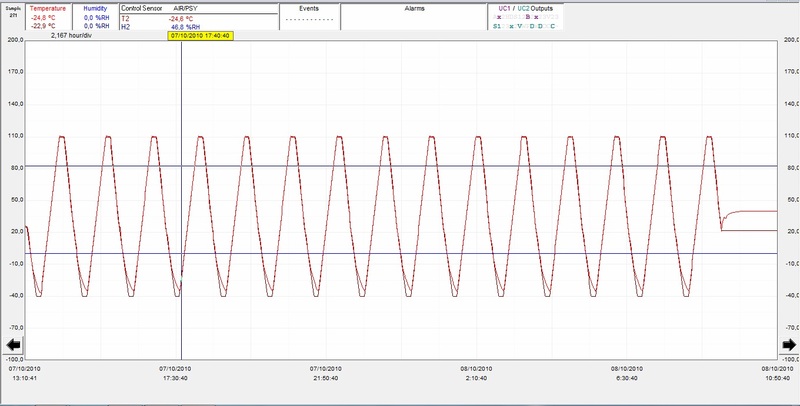 The indoor characterization involves, among other experimental possibilities: the complete module's I-V curve acquisition, power measurement and acceptance angle curve (angular transmission response of the CPV module) characterization. This solar simulator is based on a pulsed flash lamp which reaches more than 1000 W/m2 during some miliseconds, which is high enough to acquire the CPV module's photocurrent in each light pulse. A cPV refernce irradiance sensor is previously outdoors calibrated, for its calibration even spectral parameters for correlating indoor with outdoor conditions are under monitoring. The system is capable of measuring modules up to voltages of 400V and up to currents of 10A. The maximum module's active area is limited by the 2m diameter parabolic mirror. ISFOC has completely implanted this Lab in order to hold the test defined by the IEC 62108:2007, and UNE-EN 61215:2006, IEC 60068-2-21:2006 y ANSI/UL1703 as well. Meanwhile, a warehouse for test samples and another room devoted to different hand-made tasks, sample adaptation and test preparation have been implanted as well. As to assure a quality rigorous reliable service, this LAb's target is to follow the UNE-EN ISO/IEC 17025 guideñones. Work instructions, procedures and test methods issuing. ISFOC has two climatic chambers and one UV light chamber. 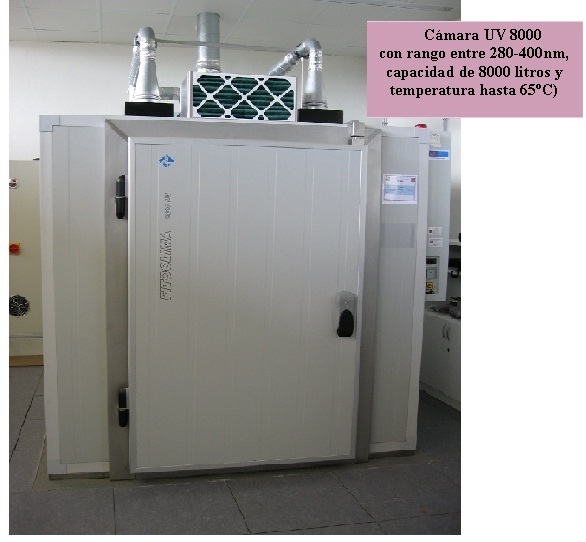 One of the climatic chambers and the UV light are of large volume (8.000 liters), while the other climatic chamber only has a volume of 1.500 liters. This offers great diversity of sample size. These chambers also have an important feature: high speed in climatic ramps. 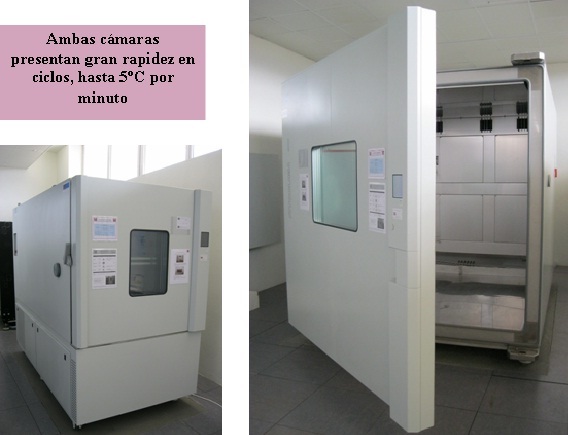 The tests performed by these chambers correspond to accelerated aging, from climatic tests with humidity to UV radiation one, but mainly the tests indicated in the IEC standard 62108 for CPV modules such as "thermal cycle test", "humidity freeze", "damp heat" and UV exposure. Using the programming software of the 3 chambers, ISFOC can adapt itself to all the different needs of testing requirements, carrying out custom essays. All three chambers are linked to the Solar Simulator, achieving degradations in the samples after the accelerated aging. ISFOC owns a haul launchar which simulates the possible weather conditions and which includes a mould for modelling haul. Test is held reaching 22 m/s (80 km/h) by impacting over the sample as much as necessary. ISFOC different tools or equipments to hold the mechanic load test are listed below. 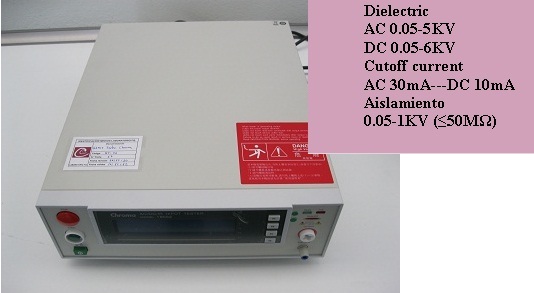 Programmable Power Supplies - up to 20 A and 500V. 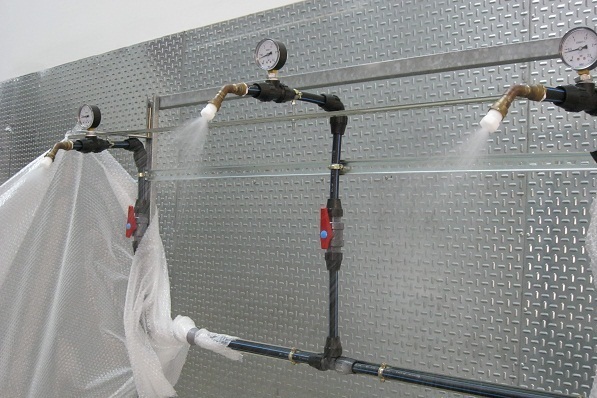 Rain test structure is made up of 3 taps with independent spray to 35 bar. 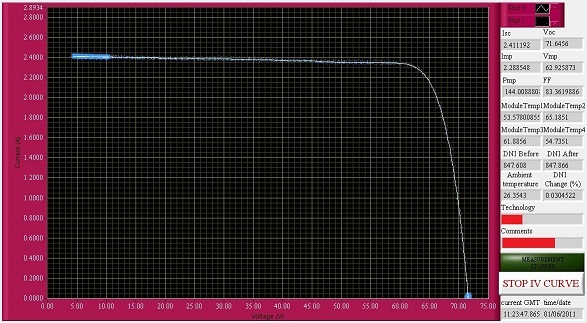 This test is help as to observe the module reaction when facing rain. As previous step to the analysis of CPV technology in plant operation, it is mandatory to know the different weather conditions. In that sense, ISFOC has developed a full CPV module characterisation equipment, able to execute I-V curves over 8 modules simultaneously, by acquiring temperature data, radiation or any other meteorological variable of interest. This equipment, all together with the SENER high-accuracy tracker, allows carrying out studies of the different CPV module technologies, each outdoor measure contemplated in IEC 62108 as well as calibrating monomodules (reference sensors) as to use them in the Solar Simulator. As an ISFOC own design, this equipment is easy to improve and to be widened, being a versatile tool for R&D tasks deployment.